Ferrari's Fernando Alonso said he believes he could have taken an "easy" pole position at the Italian Grand Prix without problems with his car. The world championship leader qualified 10th after a mechanical failure in the final part of qualifying. He had been fastest in the first and second parts. He said: "Maybe today was an easy pole. It's never easy but it was a good chance - the car was performing well. "We need to take this potential into the race and recover some positions." The 31-year-old Spaniard is behind all but one of his world championship rivals on the grid. The McLaren drivers Lewis Hamilton and Jenson Button qualified first and second, Red Bull's Sebastian Vettel will start fifth and Lotus's Kimi Raikkonen seventh. Only Red Bull's Mark Webber is behind him in 11th. 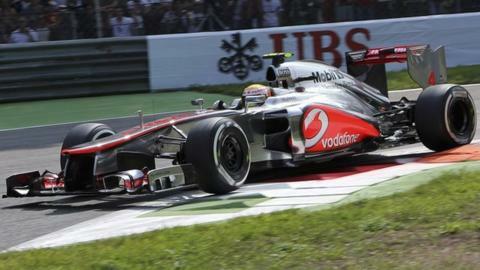 Asked if he could have battled for pole, Alonso said: "I have no doubts this time. "Sometimes you never know, but this time we were [one minute] 24.1 with the hard tyre, we were 24.0 with the medium tyre in Q2 with an easy lap, and then in Q3 we know we have always three or four tenths in the pocket." Hamilton's pole time was a 1:24.010. Alonso said Ferrari knew something had broken in the rear suspension, but that they would not know exactly what until the car came back from its official checks. The team said they suspected a broken rear anti-roll bar. "In Q2 the car felt perfect," Alonso said. "The out lap in Q3 it felt good and then when I pushed for the first attempt in Q3, I felt something wrong and I said on the radio we need to check the car. "We hoped to complete one lap and maybe overtake some cars that were not going out, but everybody went out so we did not take any advantage of completing the lap. Nothing we can do now, I think for tomorrow everything will be OK."
Ferrari's Fernando Alonso is the only driver to have won three races this season. Red Bull's Mark Webber, McLaren's Lewis Hamilton and Jenson Button have won twice. Ferrari president Luca di Montezemolo said: "Of course I am extremely disappointed, because this was one of the easiest situations in my career, which started in 1973, to get a pole position in Monza. "Alonso was absolutely the quickest, the car here is extremely competitive. "To start 10th instead of first, we have to be disappointed, particularly because this happened after what happened in Spa, when we lose all the points, and in front of Monza and at a very important point in the championship. "Felipe has a huge opportunity to win the race tomorrow, for him, for us, for his future. "And you know and we know how strong is Fernando in the race. I hope tomorrow we will see a different situation." Qualifying highlights: 17:30-18:45; BBC One.